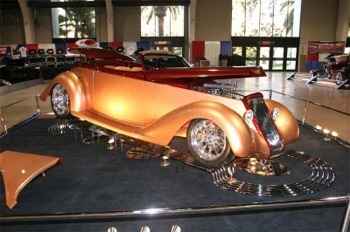 The 2007 Grand National Roadster Show, owned and produced by John Buck, presented some of the most beautifully designed and built roadsters by the best car builders in America. This year the roadsters were all outstanding. I asked Don Prieto, a judge at the 2006 Pebble Beach Concourse, and he said “it will be darn hard to judge the cars this year.” The winner from last year, Ken Reister’s Impression, designed and built by Chip Foose, was on display, next to the AMBR (America’s Most Beautiful Roadster) Trophy. Also on display was the 2005 AMBR winner, Paul and Erik Hansen, of Pleasanton, California, and their ’32 Ford Roadster called Seduced. 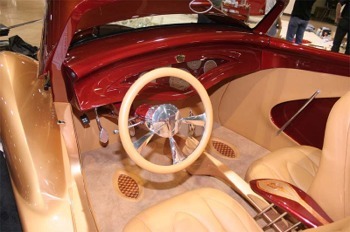 Steve Moal was the designer of this dark maroon with tan cloth-top roadster, and brown leather interior. Here are the contestants. 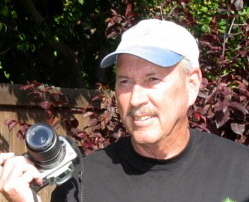 Dennis De Camp from West Covina, California, was contestant 900. 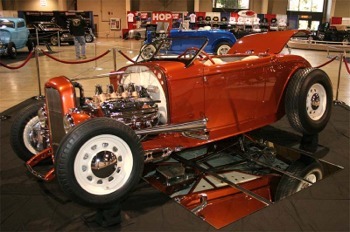 His ’32 Ford Roadster was designed and built by Barry’s Speed Shop, with a body by Marcel, and sporting a 427 c.i. Ford aluminum block engine. The paint scheme was a deep cherry red color with brown leather interior. Racecar headrests were built into the back of the driver, and it had sloping bucket seats. 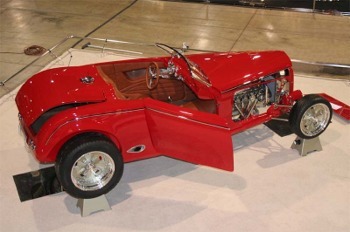 Entrant number 901 was a sporty ’32 Ford Roadster that was named the Spencer2, after the original Doane Spencer roadster. The owner is Dennis Higginbothem from Pomona, California. Exterior was jet black and the interior was brown leather. 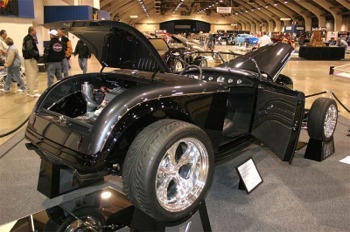 - Car number 903 was a ’32 Ford Roadster owned by Steve Barton, from Las Vegas, Nevada, called Xtreme Thunder. Body was by Marcel. The engine was a 904 c.i, engine by Joe Schubeck. Car number 902 was a ‘35 Ford Roadster owned by Kevin and Karen Alstott, from Fort Dodge, Iowa. The body was by Marcel’s Custom Metal, and was powered by a 408 c.i. Dodge Dart engine. 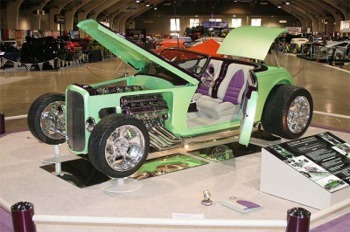 It won at the first show that it entered, the 2006 Detroit Autorama’s Ridler Award for outstanding engineering. The body was a copper/gold hue with a deep copper brown top. The car had a wide, spacious trunk, and was full-fendered. The grill was curved which reflected the light into impressive chevrons. 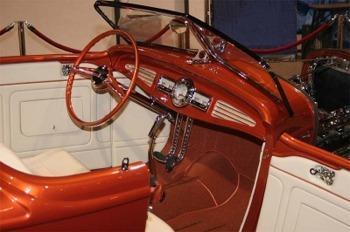 The interior was an orange/copper upholstery with movable bucket seats. 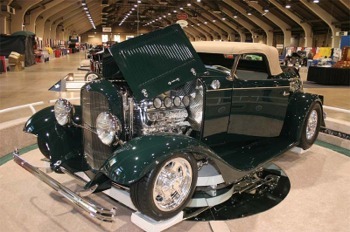 Car number 903 was a ’32 Ford Roadster owned by Steve Barton, from Las Vegas, Nevada, called Xtreme Thunder. Body was by Marcel DeLey and his sons Marc and Luc. The engine was a 904 c.i, engine by Joe Schubeck. Color was lime green, with purple and cream white upholstery. 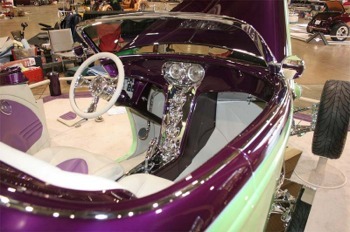 The dash was upright; not side to side, and it had a removable purple hardtop. 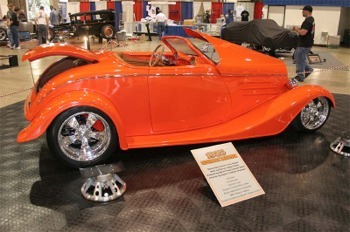 Contestant number 904 was a ’32 Ford Roadster owned by Jesse Greening of Cullman, Alabama. Exterior was a maroon red, with gray leather upholstery, built by Greening and powered by a 454 c.i. Chevy engine. The transmission, body and machine work was all done by Greening. It had a convertible cloth top, and the chrome plating was done by Advanced Plating of Nashville, Tennessee. 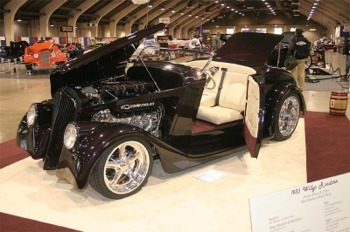 Number 905 was a ’32 Ford Roadster owned by Troy Ladd of Burbank, California, and built by Hollywood Hot Rods. It had a Brookville body, and was powered by a 392 c.i. Chrysler Hemi engine. 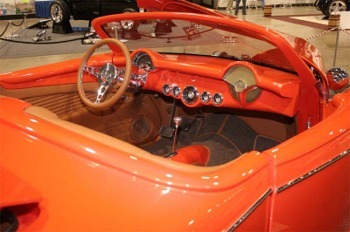 The exterior color was a deep copper, with light tan leather interior and deep copper/orange carpeting. 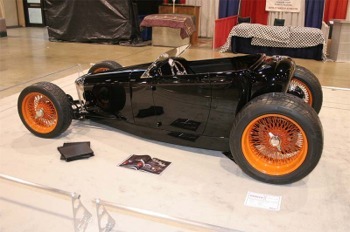 AMBR contestant number 904 was a ’32 Ford Roadster owned by Jesse Greening of Cullman, Alabama. 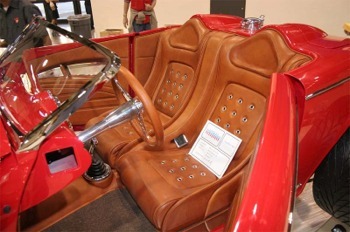 Entrant number 906 was a ’33 Willys Roadster owned by Bruce Cohn of Glen Ellen, California. 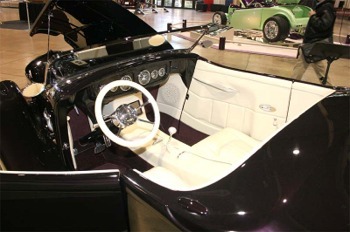 The car was built by Ron Attebury and Matt Dodd, and the color is amethyst, with a hint of eggplant violet. 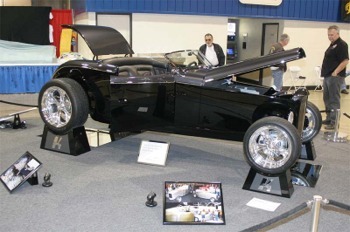 This was Bruce’s first show and the car was completed just 36 hours prior to the show. Cohn was a bit nervous, but excited to be in the show. He plans to show the car for a year, “then drive the heck out of it,” he said. Bruce owns a winery in the Sonoma Valley in Northern California and the car will look great on the country roads. It was powered by a 502 c.i. fuel injected GM big block engine. The car is all metal, stretched an extra 6 inches, with a removable hard top, suicide doors and Budnik wheels. Car number 908 was a ’32 Ford Roadster owned by Ashley Marie Webb of Burton, Michigan. 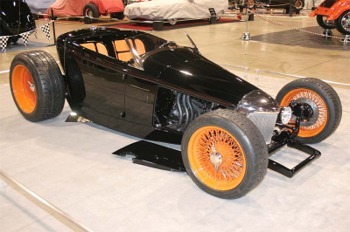 Named The Wicked Wedge, the car has a jet-black exterior, with orange leather seats and orange steel rims. It has a longer length, is slung lower to the ground and has a “wicked looking” black enameled engine compartment. Car number 909 is a ’35 Chevy Roadster and is owned by Carl Sprauge of Fullerton, California. It was built by Barry’s Speed Shop and has an orange/red exterior with a tan brown interior, Kugel suspension and Corvette dash. 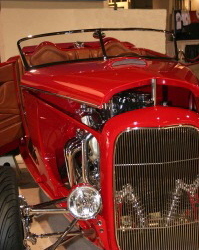 Car number 910 is a ’32 Ford Roadster owned by John Lawson of Fresno, California. The exterior is a British racing green with tan stripes and a tan cloth removable top. It has a Dearborn Deuce body and is powered by a 572 c.i. Chevy big block engine. 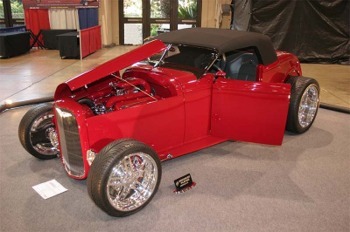 Contestant number 911 was a ’32 Ford Roadster owned by Jerry Kugel of Whittier, California. Kugel, well known on the dry lakes and at Bonneville, drove his car to and from the show. The body is by Marcel and hand formed out of aluminum. Kugel built the chassis tube frame. The trunk is in the front under the hood, and the V8 Oldsmobile Aurora engine is in the rear. Both the exterior and interior of this sharp looking roadster is black, just as Henry Ford would have wanted it. 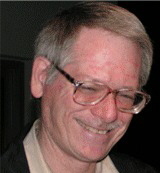 Dan Weber was the upholsterer. - Entrant number 906 was a ’33 Willys Roadster owned by Bruce Cohn of Glen Ellen, California. The car was built by Ron Attebury and Matt Dodd, and was completed just 36 hours prior to the show. Cohn was a bit nervous, but excited to be in the show. He plans to show the car for a year, “then drive the heck out of it,” he said. It was powered by a 502 c.i. fuel injected GM big block. The car is all metal, stretched an extra 6 inches, with a removable hard top, suicide doors and Budnik wheels. Car number 908 was a ’32 Ford Roadster owned by Ashley Marie Webb of Burton, Michigan. Named “The Wicked Wedge”. Car number 909 is a ’35 Chevy Roadster and is owned by Carl Sprauge of Fullerton, California. And the winner is … Car number 902 a ‘35 Ford Roadster owned by Kevin and Karen Alstott, from Fort Dodge, Iowa. The body is by Marcel’s Custom Metal, and is powered by a 408 c.i. Dodge Dart engine. 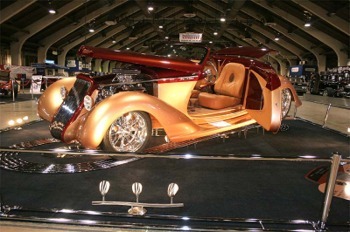 It won at the first show that it entered, the 2006 Detroit Autorama’s Ridler Award.